Two Education and Training program instructors from Texas State Technical College in Harlingen recently garnered some national attention in Washington, D.C. Here, they made a presentation at the National Association for the Education of Young Children conference on classroom play centers. TSTC Education and Training Department Chair Myriam Aguila and instructor Mary Elizabeth Hollmann were chosen from among hundreds submitting presentation proposals. They are also the only ones presenting from the RGV. NAEYC is one of the largest early childhood education nonprofit associations in the U.S. It represents nearly 60,000 teachers, para-educators, center directors, trainers,college educators, policymakers and advocates worldwide. 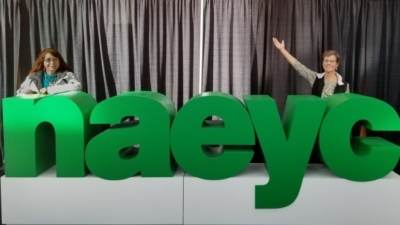 At the annual NAEYC conference, educators gather to share lessons and classroom strategies as well as ideas. Their presentation, “All Children Can Learn Through Dramatic Play,” was part of the conference’s Spanish track. The two put a focus on how classroom play centers that imitate places like kitchens, post offices and doctors’ offices encourage speaking, vocabulary, reading, spelling and writing. Aguila and Hollmann also included some of their students’ work, such as prop boxes, to showcase in their presentation. The prop boxes included themed learning tools also used as educational materials at TSTC’s NINOS Head Start program. TSTC in Harlingen’s Education and Training program is the only one of its kind among the college’s 10 campuses. It focuses on early childhood education through sixth grade, offering both certificates and associate degree tracks. It is one of the largest programs at TSTC. More than 400 TSTC students and close to 200 high school dual-enrollment students are enrolled. Dual-enrollment students hail from school districts in Harlingen, Los Fresnos and San Benito.